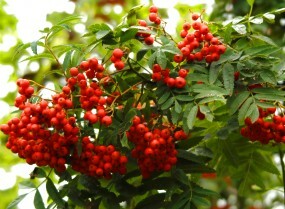 MOUNTAIN ASH (Sorbus aucuparia) (Rowan). Hedging Plants, Trees, Shrubs and Conifers. Autumn fruit on Mountain Ash at Garden Centre. Tr = Transplanted, click here for more details.